Looking at the Mongolian countryside, it is hard not to notice the white specks by hills, rivers, or in the middle of what seems like nowhere. As you get closer to these white specks, you will notice herds of sheep, cow, goat, horse, and maybe camels slowly moving around it, as if protecting it. Getting even closer you may notice that there was another white speck hiding behind the first one. And getting even closer you may hear the loud barks of the dog to alert their owners of the visitor. By the ruckus of the bark, the owners will bow their heads through the doorway of the white speck, which is of course a ger, and call his dog closer. 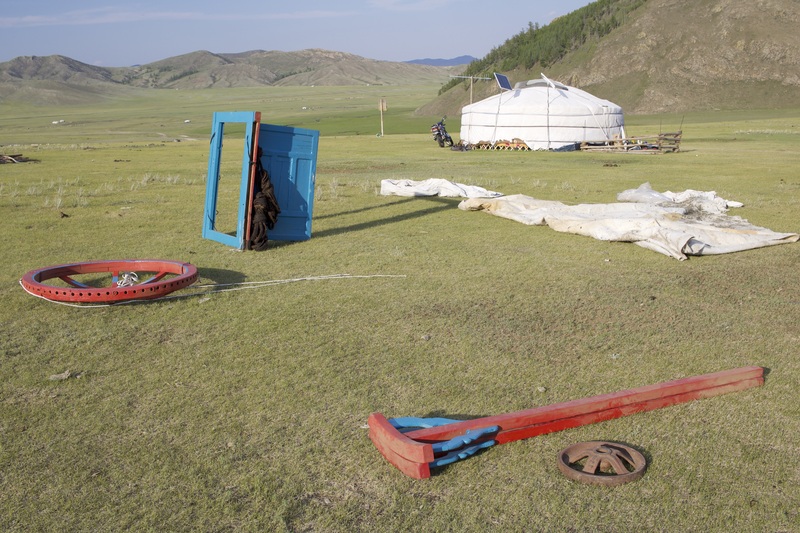 This is a typical progression in the Mongolian countryside, where our countryside has not changed much since the time of Chinggis Khaan. 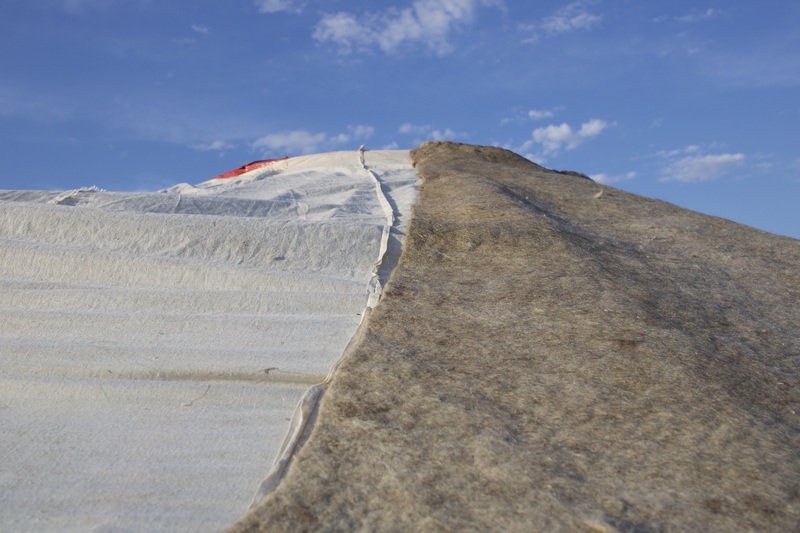 A ger is a traditional home and it means both yurt and home. 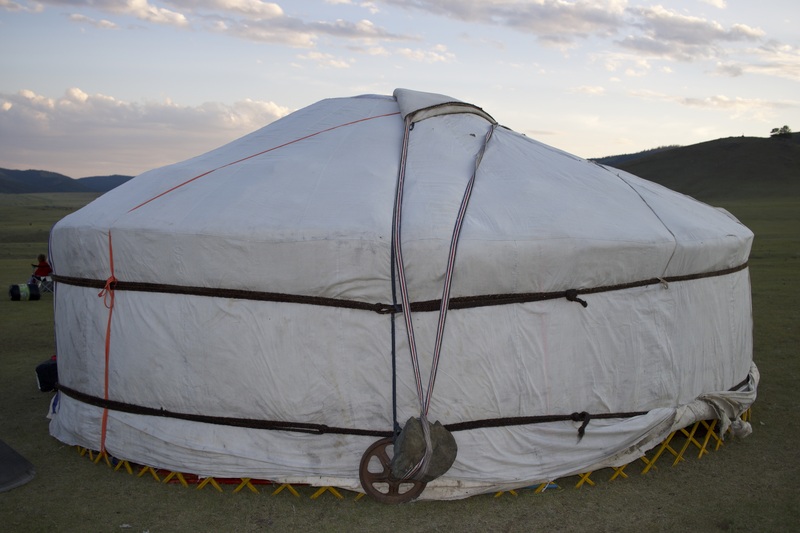 The yurt is compact and easy to travel with. The components when strategically put together can keep you cool during the summer and warm during the winter. 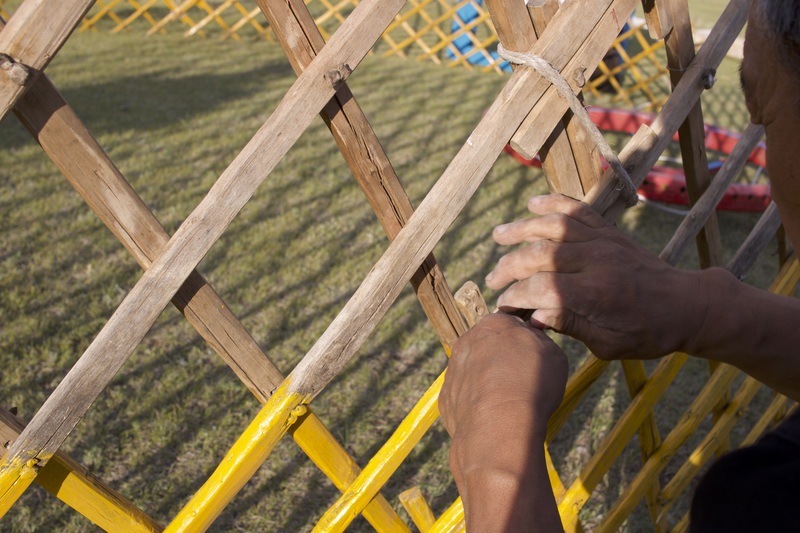 This year, I had the opportunity to witness a ger getting built in Baruun Buren, Selenge. The photos below show its progression. During our 12 day stay, it was amazing to have shelter in the pouring rain and escape from the unbearable heat, but at the end, it was also amazing to break down everything and leave as if we were never even there in the first place. 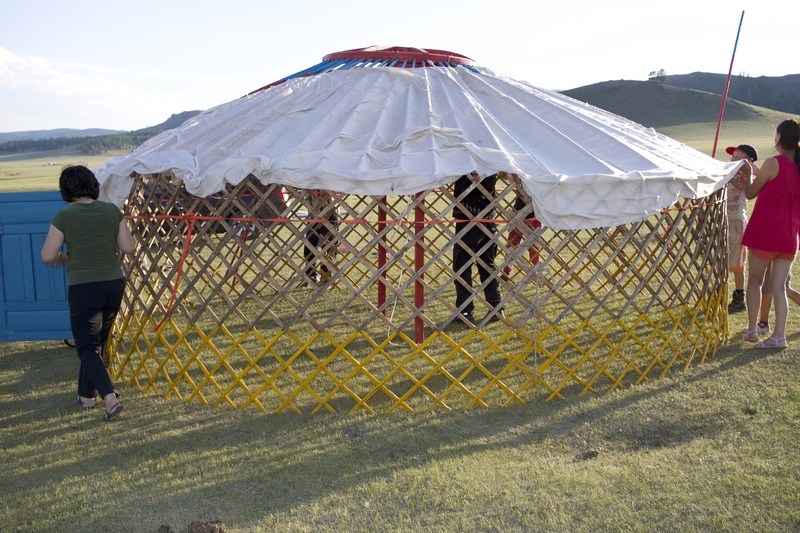 In a country where nomadic culture is still prevalent, there is always discussion around development of the country and where our traditions lie within this development. 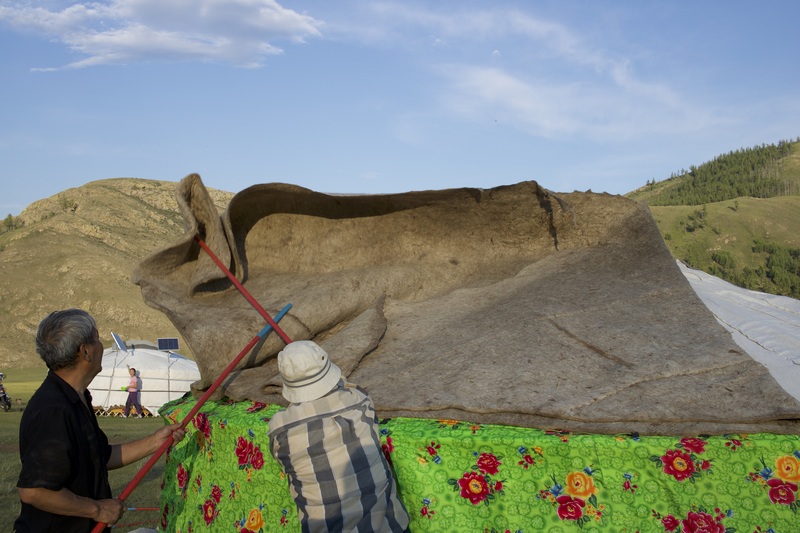 Many gers have moved from the countryside to the city especially following the dzuds of 2010 and 2016, where nomadic families lost their herds and their livelihoods to intense winters. 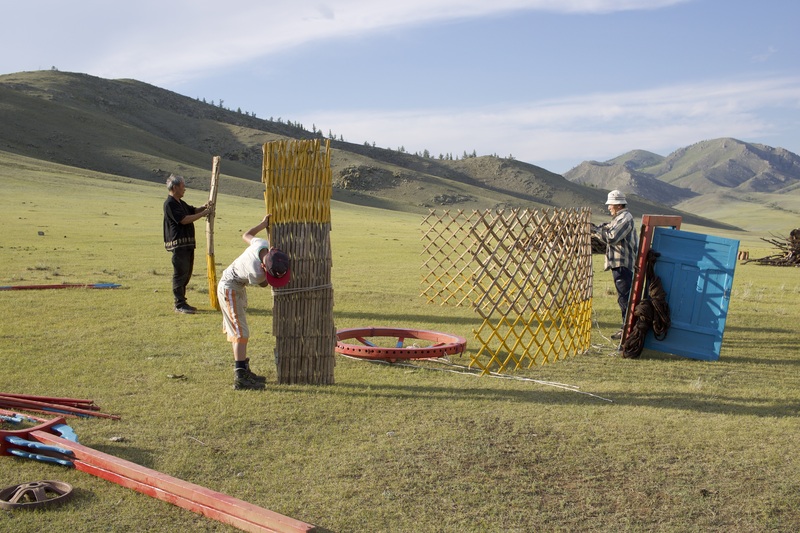 These families came together to build neighborhoods of gers in the capital city Ulaanbaatar, which is commonly called the ger horoolol or the ger slums. Usually as the families settle in their new areas, they make additions to their gers. For example, maybe they would build an extra hallway before the door so that there is another protection during the winter from the cold and the pollution. In these settled areas, the ger is the first step to becoming more settled in the city. Generally families would want to build their own homes from more traditional materials or to move to an apartment complex closer to the center of the city. Many construction workers also use the gers. In or around the capital, you will notice several of the gers built close together. These are for the workers of a nearby construction site, and who are probably migrants to the city either from the countryside or from China. The gers are built for the migrants to live in, and then broken down once the construction is completed. But of course the gers are still very much used in the countryside, as they were meant to be used, with seasonal changes in scenery as nomads move a couple times a year. They also have made improvements in the last decade – many are now accompanied by a small to medium sized solar panel and a satellite dish. 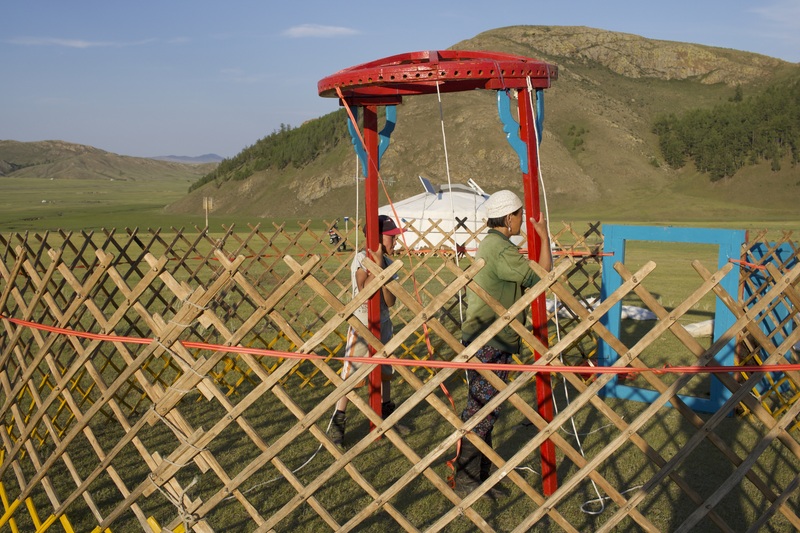 Although in the city the gers are being used as temporary homes or as a transition before moving to more sound structures, I hope that the gers in the countryside will continue to improve and be permanent fixtures within Mongolia’s development.